Once in a generation, a special athlete rises to stardom in front of our eyes. 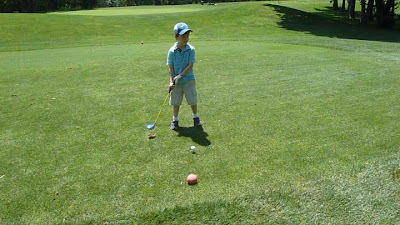 In golf we've seen it with Bobby Jones, Arnold Palmer, Jack Nicklaus, Tiger Woods as they all started playing at a very young age. Tiger's prominence was captured on national television when he was 3. And now a new age has dawned for golf as we know it. Joshua Robert Rose is now officially a golfer. I had been meaning to take Josh out on a real golf course for over a year now. 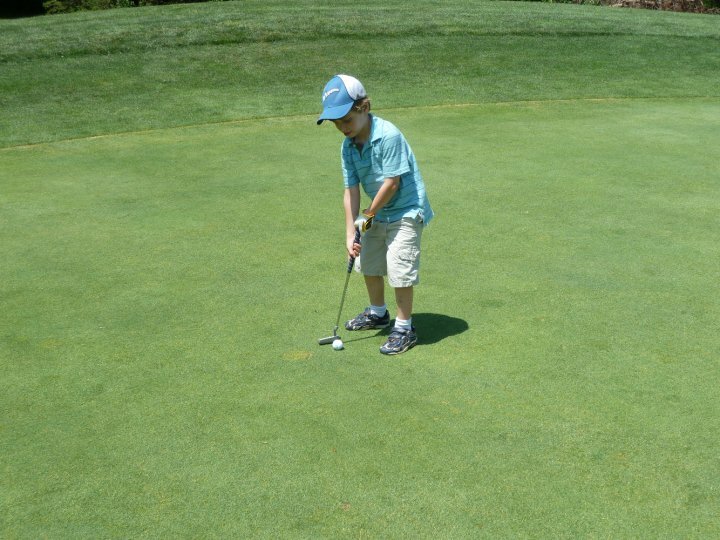 He has been to the driving range with me since he was 3 and showed some promise in hitting the ball pretty straight. 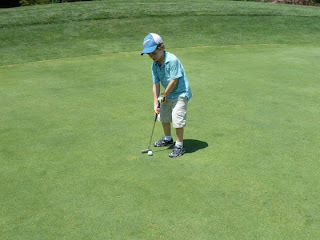 I finally decided to get him out for 9 holes at the local par 3 course on Father's Day. My friend Doe tagged along and the three of us walked the 9 hole circuit on a steamy Summer Sunday. All I wanted to get out of this round was to have Josh enjoy the game. Ever since Josh was born I've been eagerly anticipating the day when I would get a chance to teach him how to play a game I've loved my entire life. I think my mission for his first round was accomplished. He had a great time walking the course and hitting the ball. Despite some really disastrous putting (yes... I know... he's only 5!!! ), he did play pretty well. 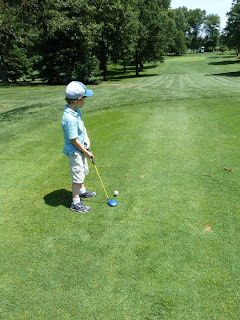 He seemed to be actually more consistent off the tee than the 10-year-old playing in the group in front of us. On his very first hole, Josh drove the ball in the fairway down the middle and then actually sank a 25-foot putt for a 7 (quad bogey). He matched his 7 on the 2nd hole (out-driving Dad in the process after I topped my 8 iron shot). After two great opening holes, Josh showed he is human by getting a bunch of 9's, 10's and 11's for the rest of the round. Josh's legitimate 9-hole total was 79. I shot a 39 myself but was not really concentrating on my own game. I had to help carry his bag around the course. I need to get him a better bag that has backpack type straps. Overall, he had a blast out there. He got genuinely excited when he would hit a nice shot in the air that went far. I even had him give Doe the old "Does your Husband play?" verbal jabs after Doe hit a short putt. We finished the round at the pro shop drinking a nice refreshing Gatorade together. I'm sure this is just the first round of hundreds we will play together as Father and Son. I'm already looking forward to getting back out there again with him and for Alex and Becca to fill out my foursome eventually. The highlight of the day was driving back home with Josh and having him say to me "I want to go play again sometime Dad." In golf, all it takes is one round to get you hooked. Here's some extra pictures from the round. If you missed it, I have a video of Josh up on Facebook hitting a tee shot.